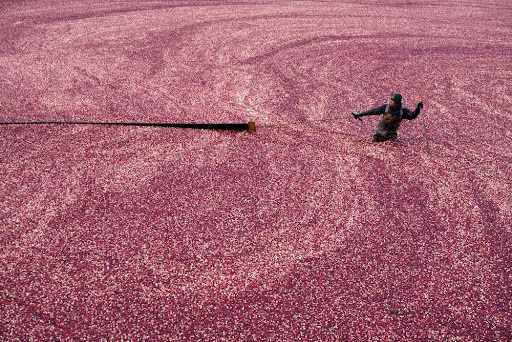 Hey it’s Thanksgiving and if you think turkey, think Cranberry Sauce. 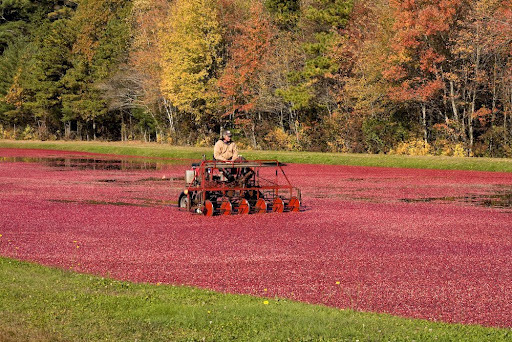 Other than a can, how the sauce got there was an awaited education best learned at the source,the master of cranberries, Ocean Spray country where multi -colored ruby berries grow along the ground on vines. 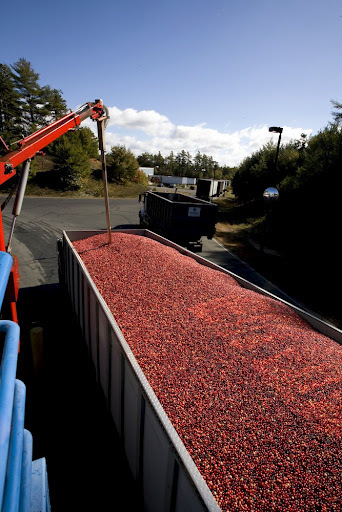 Prior to this century berries were harvested by hand, with a scoop which had 26 seven inch teeth sticking out from a wooden handle, sliding into the vine like a rake, plucking up the berries and often the vine with it, a long backbreaking process. ”Water Reel” (video) aka egg beaters can knock them off the branches while a man standing in front guides and marks the place where they left off and also feels for any deep holes ( something you don’t want to fall into with waders on !). Their beautiful jewel like marbles float to the top. How? They have a small air pocket in the middle where the seeds are, how convenient. Corralling them together they are sucked up into a truck that drains the water, and delivers them to the plant where each truck is weighed and product tested for any pesticides or other contaminates….. 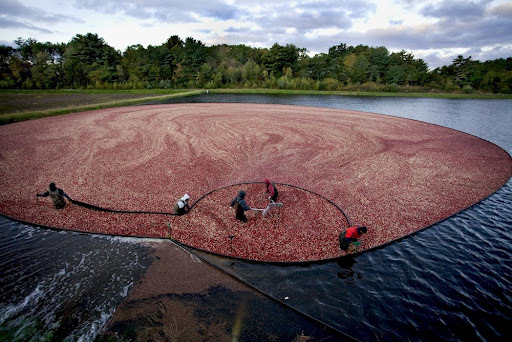 So the next time you slide out that familiar red log of cranberry jelly for holiday turkey or chicken,( mmm duck as well) or any other kind of cranberry sauce item you might have in mind, think of the process it took to take it from here to your table. To me they will never look the same. Hey are you tired of that old ruby log sliding out of the can and skidding onto the plate? Try this easy to do variation that goes great not just with turkey but with everything from duck to salads. 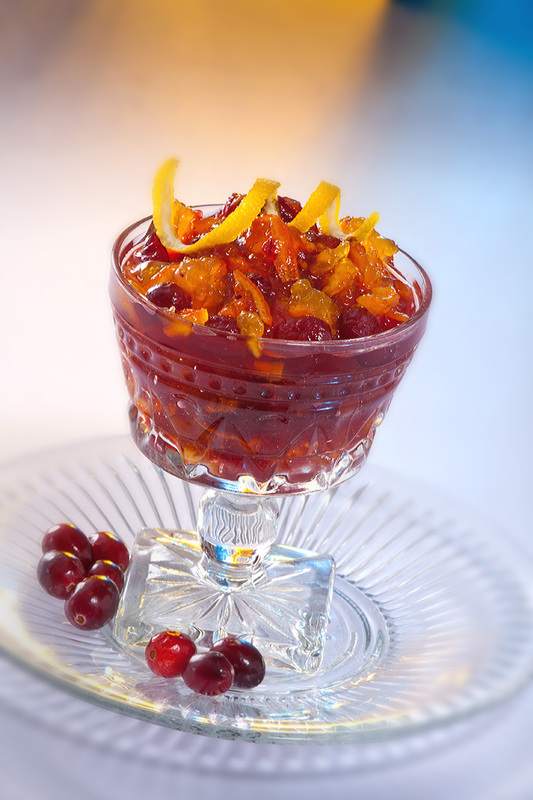 mix 2 parts cranberry sauce to one part orange marmalade… to add some dimension add 2 tblsp of Grand Marnier ( better try a shot to make sure it’s fresh of course) and add 1 tblsp of finely chopped fresh ginger.